An extremely rare pic of Alan (snapped on the sly) with his friends Winnie and Piglet. 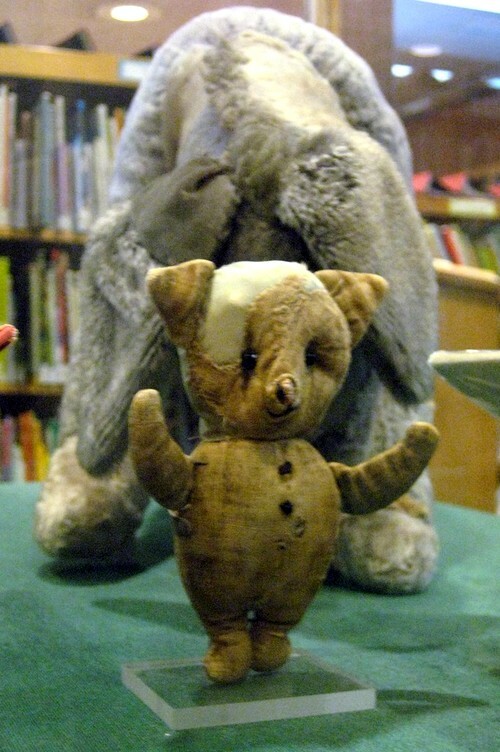 He greatly enjoys the company of both, but has an especially tender spot in his heart for little Piglet. Whenever Alan sees him “he is always smiling right back,” and “looking at him makes me happy,” says he. 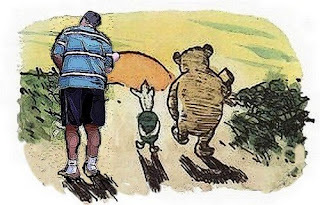 As I’ve mentioned before, Alan is a huge fan of Winnie the Pooh, Tigger, and especially Piglet. So I tend to keep an eye out for them as I bounce about the Internet in my occasional rambling searches for the next Great Image. When my brothers and sister were all children (and we were, honestly!) 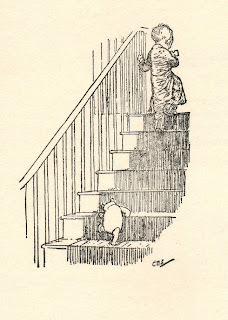 long, long ago, we grew up on A.A. Milne’s The House on Pooh Corner, and When We Were Very Young, brought to life in a wonderful way by the amazingly suitable illustrations of E. H. Shepherd. More recently, I gave the books to my niece and nephew, the one-of-a-kind Alianne and her unstoppable brother Thompson. 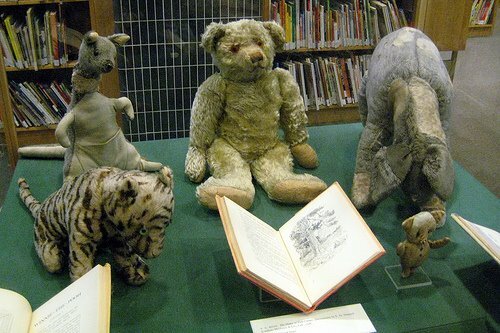 Can stick together, says Pooh, says he. “That’s how it is,” says Pooh. 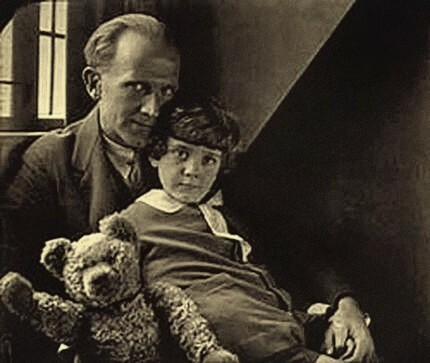 Here is the author with his son Christopher Robin, and Pooh. The bear, back when it was only a stuffed toy, was made by England’s Farnell & Co., bought at Harrod’s Department store, and given to the boy in celebration of his first birthday. 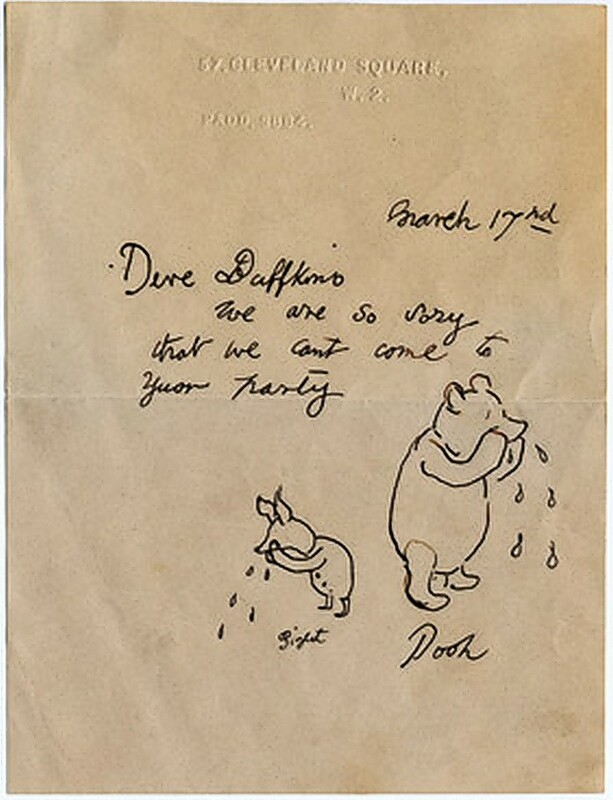 And though their working relationship was apparently not the smoothest, the wisdom of entrusting Ernest Howard Shepherd to give Pooh and his friends form, and bring them visually to life, is far beyond doubt. 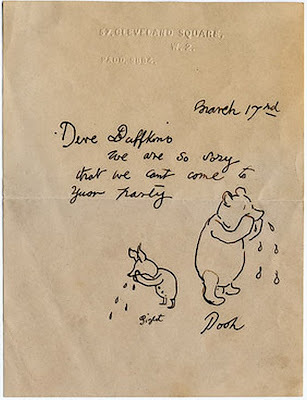 Pooh and Piglet send regrets, as forwarded by Ernest Shepherd. Piglet, close up, on the small side but confident with Eeyore at his back. And the answer that occurred to me, with a singular clarity, was simply this: Love. One of my favorite Calvin & Hobbes Sunday strips, October 1993. (To view larger, just click on image and return to browser using back arrow.) It says so much. The great Bill Watterston, as his idol Charles Schultz years before him, undertook a long and bruising struggle in fighting to get a strip into the newspapers. 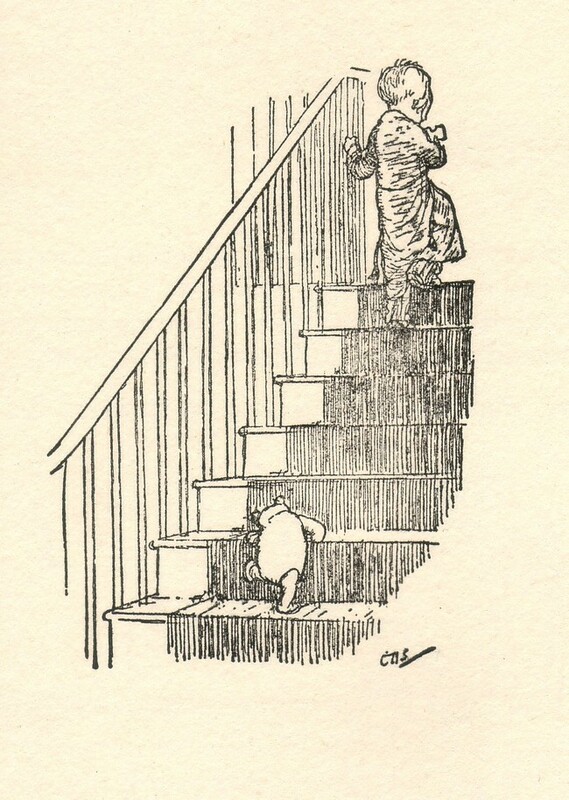 He says it was the talking tiger that finally opened up that door. The rest is history. 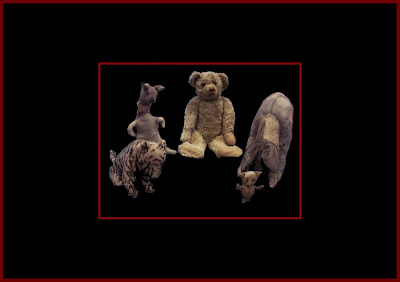 Which in turn got me to thinking: Did you know that, without the gift of that vision you carry in your heart for those that you love, they might feel themselves more as these tattered old dolls than truly alive and filled with potential? In a sense, it is your love that fills their sails and sets them on course for each day’s journey. Yes, you. You don’t have to be perfect to give good love. Look into their eyes, you’ll see. The important thing is to never give up. Love is never just for others, though that toxic notion is indeed commonplace. And: are you consciously aware of the ones in your life that are giving you life, perhaps imperfectly, but as best as they can? Just some food for thought. The problem with the word “love,” in probably every language, is that it means so many different things that it can come to mean nothing at all. 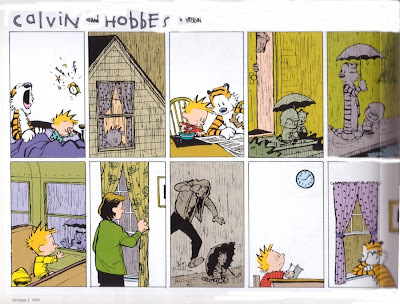 And, it’s often reduced to the simply romantic, or even sentimental. “This is the wonder that’s keeping the stars apart.” Now, that is an immense physical force, none the less ancient or reflective of sublime rhythms because it might be reduced to theoretical calculations and equations in Physics. And the real wonder of it is, it’s inside you right now. With every beat of your heart, every breath you take. It extends outward through your voice, and spreads with your touch. Why? Who knows? But what of it? Well, that is very much up to you. Why not celebrate it, yes, even now? You are currently browsing the archives for the Milne category.